One issue with having an online presence is dealing with the daily onslaught of spam. Luckily, we have filters that hide most of it and bury it for ever. Bless him. I can picture the author writing and rewriting his lines for hours, maybe even days, carefully honing them until he comes up with the perfect message. The one you couldn't possibly ignore. The masterpiece that's going to make him his fortune. 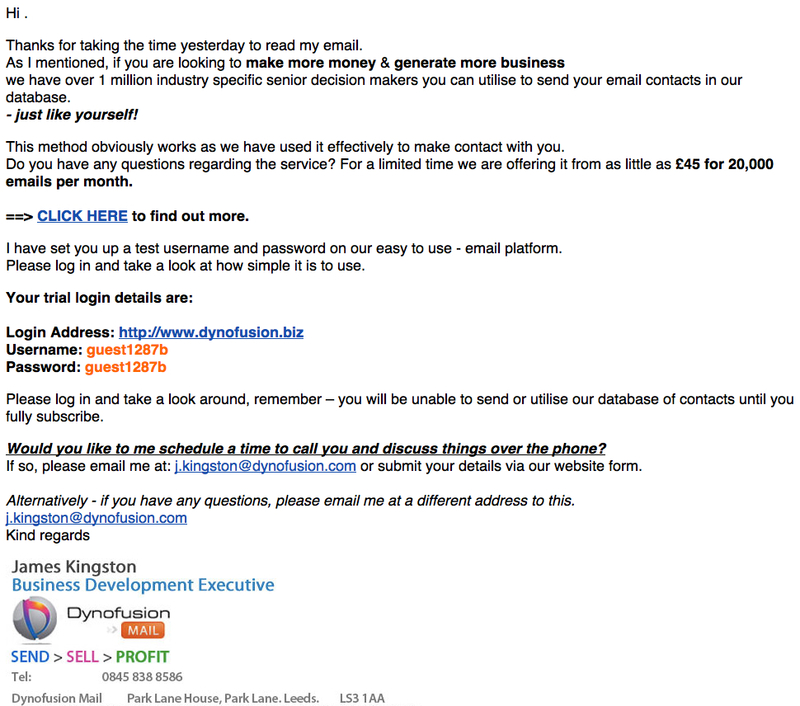 It would be laughable but for the fact that the email is all about using email to gain business. Perhaps crying is the more appropriate option. Please take a second look as I steer you through it. Translation: I don't know who the hell you are but I'm going to send this email to thousands of people using this spammy scattergun technique in the hope that one of them reaches a target. Please don't use the word Hi when you and I have never spoken to each other, exchanged business cards nor even travelled on the same bus. It's Dear . to you, James. And while we're at it, no full point please. It's a salutation, not a sentence. Well, you've certainly made a good start. 'Hit the ground running' was no doubt the expression that impressed you the most at your Marketing For Dummies evening class. So far, you've made a total of four keystrokes and you've already managed to both alienate me and antagonise me. I'm hardly receptive to your message, even if it predicts the Second Coming. I think I'm beginning to understand exactly just how effective this email marketing is. Thanks for taking the time yesterday to read my email. I didn't receive an email from you yesterday. You may have sent me one - along with probably 50,000 others - but it's highly likely that it went directly into my spam folder resulting in instant deletion and oblivion. But you actually have no idea whether I received it, let alone read it. Correction. As I mentioned, I didn't receive your email yesterday. Comma after business, please. And you should use the word 'and' rather than an ampersand. It's lazy and tacky. we have over 1 million industry specific senior decision makers you can utilise to send your email contacts in our database. I know what 1 million industry specific senior decision makers are. I can even picture them in my mind. But why would I want to utilise them to send my email? Seems a little excessive. I'm not sure I've sent more than a few thousand emails. Ever. I think the decision makers' time would be better spent making decisions, don't you? And you think it would be a good idea to send my email contacts in your database? Even if I understood what that meant, what good would it do? What would they do there? Firstly, a sentence doesn't start with a hyphen. But it does, at the very least, warrant a capital letter. Just like myself? You mean that I can send my email contacts in your database too? I thought the 1 million senior decision makers were already doing that. Or do you mean that I am also an industry specific senior decision maker? How do you know this? I might simply be the guy that intercepts and redirects the email. Moreover, if I am a senior decision maker, then I'm busy, er, making decisions. Not reading this junk. Oh, I get it. There's an exclamation mark! So it must be an inspirational message. 'Just like yourself!' Well, that's nice as I've been toying with the notion that I'm not a particularly pleasant person recently. Oh, wait. You're agreeing with me, aren't you? You're actually confirming that I'm right, I'm not a nice person at all. Well screw you. So far, so good. You're one paragraph in and already I want to throttle you. This method obviously works as we have used it effectively to make contact with you. Method? What method? This is the first time you've mentioned a method. Or did I miss something? At this point I'd rather like to make contact with you, actually. Your face. My fist. Should be pretty effective. Do you have any questions regarding the service? Yes. I'd like to ask 'What service?' as you've not yet mentioned that before either. What service? as little as £45 for 20,000 emails per month. What? 20,000 emails as good as yours? That works out at 0.00225p per email. Oh, OK. Probably priced about right then. on our easy to use - email platform. Another hyphenation misplacement. I think you mean our easy-to-use email platform, don't you? Remember should be the start of a new sentence which means you're missing a fullstop and a capital letter too. And there should be a comma where you've put a hyphen. Would you like to me schedule a time...? Whoa. You're turning into Yoda. You want me to schedule to you? I'm not sure that it's possible to schedule to anyone, or anything for that matter. Wouldn't it be more sensible for me to call you on the phone to discuss things over the phone? Look. I've already told you about using hyphens instead of commas. Just stop it, please. please email me at a different address to this. No, no, no. It's different from, not different to. Wait a minute. You're asking me to email you at a different address. But you've quoted exactly the same address. Yes, I'm right. I've just checked again and it's the same address. Oh, I get it. You're actually asking me to use a different email address. So, like what then? I have a couple of suggestions. How about completenumpty@dynofusion.com or theidiotinchargeofbusinessdevelopment@dynofusion.com? I'm sure that any address similar to those will find their way straight to you. 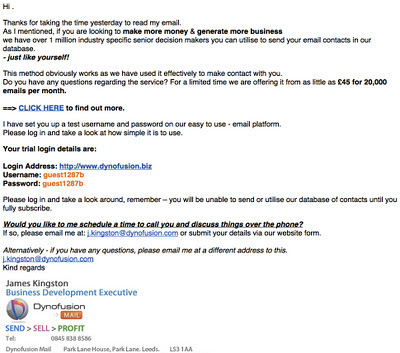 Oh, and if you ever see this, James, I'd be interested to learn just how your Business has been Developing.